are also often considered part of the region because of their long administrative connections with the former Belgian Congo. All of the states in the UN subregion of Middle Africa, plus Burundi and Rwanda, comprise the Economic Community of Central African States (ECCAS). Like all of Africa, the central region fell victim to the slave trade during the fifteenth through nineteenth centuries, followed by a period of colonialism. The worst recorded instances of abuse on the African continent during this period occurred in the Congo by King Leopold II, who made a personal fortune in the rubber trade. Today's situations of the individual nations in the region vary, though prevalent are high levels of poverty, human rights abuses and government corruption. As is the situation throughout the continent, HIV/AIDS is rampant. Central Africa, located along the equator, consists primarily of wide plateaus that are smooth in the central areas and more rough along the exterior of the region. The plateaus in the region exhibit a huge range in altitude, reaching up to 16,795 feet at Margherita Peak (the highest point in Central Africa) and descending into the ground in deep and narrow gorges near the Kouilou and Congo. Most of the terrain in Central Africa was shaped by climactic forces prior to human occupation. For example, the most rugged terrain in Central Africa is found along the eastern fringe of the Congo basin, where the Virunga volcanoes form a mountain range. Ancient Glaciers also played a role in shaping the Central African geography, and cut the the Rift Valley into terrain on the border of the Congo. The most notable geographic feature of Central Africa is the Congo River, which is second only to the Amazon in flow. The river is navigable for much of its length, only becoming inaccesible in a series of rapids in western Congo between Kinshasa and Matadi. Also near Matadi, at Inga Falls, the power of the Congo is harnessed in one of the world's largest hydroelectric dams. Climatically the region is marked by hot and wet temperatures on both sides of the equator. Almost 400,000 square feet of forest line the equator, and three different types of forest are found in Central Africa. The forests are bordered by a band of semi-arid savannah terrain that is speculated to have been created by slash and burn farming techniques. One of Central Africa's most famous national parks, Virunga National Park, exists within the borders of Congo. It is home to an unique assortment of native wildlife, including elephants, lions, hippopotamuses, warthogs, forest hogs, okapis, and mountain gorillas on the volcano slopes of the reserve. The Virunga National Park, however, is only one of many of the reserves found in Central Africa. Another notable national park is the Kahuzi-Biega National Park, which is famous for its mountain gorillas. Other significant national parks include: the Garamba National Park in northeastern Congo, noted for its white rhinoceroses, Upemba National Park in southern Congo, parks in the northern part of the Central African Republic, and Akagera National Park in northeastern Rwanda. Smaller national parks are found along the equatorial forest in Congo, such as Maiko and Salonga national parks. Central Africa has a long history of human occupation, with the first writing in the region dating back to 3000 B.C.E. The earliest occupants of Central Africa were Dravidians, Egyptians, Sumerians, Niger-Kordofanian-Mande and Elamite speakers who settled the region and began creating a system of community development. The earliest alphabet in the region originally included hundreds of phonetic signs, but this was eventually shortened to between 22 and 30 key sounds that formed the basis of the alphabet. The earliest alphabet system found in Central Africa was used across the continent, including the Egyptians, Meroites, Phonesians and Ethiopians. Populations that existed prior to written history are known only through the physical record of their tools; the most famous of the Paleolithic tools which have been found are Acheulian knives, used by early humans to skin animals and prepare flesh for eating. Around the sixteenth century the copper and salt industries in Central Africa stepped onto the international scene and became major players in the global commodity market. Salt from the Central African region became a major export, matched only by textiles. Textiles provided an important social role in Central African society by physically demonstrating the differences between social classes. Clothing also served as an important marker of social status, and was kept in the hands of the elder men of society. Young men, in order to secure a wife, were forced to remain obedient to the demands of the wealthy and adhere to the standards of society in order to have access to cloth for marriage. Political entities in Central Africa remained small and kingdoms failed to develop on a large scale. In this regard Central Africa stood in opposition to Western Africa, where kingdoms were the norm and political powers were quite large. The most notable divergence from typical Central African development was found in the Kuba Kingdom. A forest kingdom, the Kuba gained eminence based on the export of copper and a mystical exotic origin claimed by the leaders of the kingdom. In the 1470s, a Portuguese colony was formed at São Tomé, which opened up Central Africa to the global trade markets. The colony also cultivated a cash crop of sugar cane and operated a successful sugar mill. Unable to sustain a plantation without local support, Portuguese settlers reached out to local communities and utilized local populations in their workforces. To augment local workforces, the Portuguese purchased slaves from the mainland. Early attempts to supply the Portuguese with slaves in exchange for valuable goods eventually led to heavy involvement with the slave trade. Slaves from Central Africa were sent to three major geographic areas: the gold coast mining towns run by the Akan, to Europe to serve as domestic servants, and to local buyers for use within Central Africa. The slave trade in Central Africa was enormous. In addition to the European powers involved in this were native Africans themselves, who entered Angola, forming local followers into heavily armed bands that raided the countryside, taking captives and selling them to European sailors. The Lunda people eventually formed an alliance with the Portuguese, who allowed them to set up a kingdom in the Kasanje plain. Initially, the kingdom of Kasanje had the role of merchant brokers to the Portuguese, but eventually expanded their network beyond that confinement. Eventually the empire spread not only to the west but also eastward as far as the lower Zambezi River and the Indian Ocean. By far the most active European power in the harsh jungles of Central Africa were the French, who gained complete control of the Congo region in the eighteenth century and dramatically increased the export of slaves. Hegemonic French rule in the region also solidified language throughout and instituted French as the language of commerce in the region. Through a shared language Central Africa made steps towards developing a unified cultural identity. Not all developments under French rule were beneficial to the local environment, and under the French, increasing numbers of slaves were exported to an island in the Caribbean called Saint-Domingue, later renamed Haiti. Haiti was one of the richest colonies in the world and was considered the largest exporter of sugar prior to 1791. The abolition movement helped to end the slave trade by the late nineteenth century, although slavery continued in Africa into the twentieth century. The Dutch followed the Portuguese into Africa, making considerable inroads into Central Africa. They did not follow the same economic policies of the Portuguese, however, and eschewed the slave trade in favor of large scale ivory exportation. The commercial interests of the Dutch in Central Africa led to the development of full fledged colonies by the seventeenth century. The Dutch position in Central Africa was cemented by the sale of firearms, a fact which proved detrimental to the political organization of the region. In the nineteenth century, prosperity in Europe and North America had led to an increase in demand for ivory. In answer to this demand, traders from Egypt and North Africa crossed the Sahara and traversed the Nile to the Congo basin, where elephants were plentiful. This resulted not only in the merciless killing of elephants, but in severe disruption of local societies. Central Africans were kidnapped to serve as bearers, servants, and concubines. Some of these captives were taken out of the region and sold as slave girls in Constantinople harems, or as water carriers in the streets of Cairo. Eventually, Swahili traders and their Arab allies became involved in both the slave ivory trades. The slaves they captured were put to work on the spice plantations of Zanzibar or sold as pearl divers and domestic servants in the Arabian and Persian gulfs. A new branch of trade developed once ivory became scarce and slavery unpopular. The sap of the wild rubber vine, known as red rubber was abundant throughout the forest and savanna galleries of the Congo basin. Communities of refugees had formed in during the quest for slaves. These communities were penetrated in order to find workers for the rubber trade. It was the rubber trade that financed the first stage of formal colonial rule in Central Africa. The selling of rubber made a fortune for King Leopold II, who had made the land his private property and named it the Congo Free State. Though he began numerous developments, they were for the exclusive purposes of exploitation. Between 1885 and 1908, about ten million Congolese died as a consequence of exploitation and diseases. A government commission later concluded that the population of the Congo had been "reduced by half" during this brutal period. Eventually there were international protests, spearheaded mainly by British reformer Edmund D. Morel and British diplomat/Irish patriot Roger Casement, supported by missionaries who deplored the abuse of human rights, and as well as by famous writers such as Mark Twain. In 1908, the Belgian parliament, which was at first reluctant, bowed to international pressure (especially from Great Britain) and took the Free State as a Belgian colony. From then on, it became the Belgian Congo. The year 1960 ushered in the end of colonialism in Central Africa. Black nationalists of West Africa had won the right of self-determination from Britain, awakening France and Belgium to the necessity of change. General Charles de Gaulle of France led attempts to redefine political organization in the region. New constitutions were drafted and parliamentary elections were held. King Baudouin of the Belgians dutifully participated in the independence celebrations of Congo at Leopoldville (now Kinshasa) but was not as aggressive as de Gaulle in assisting the newly independent nations in their reconstruction. The national and political borders throughout Central Africa divide many cultural groups along artificial boundaries. Over eleven ethnic groups exist in Central Africa, many of which are spread across multiple countries. A prime example of political borders dividing a cultural group is found in the Twa, whose home forest lands reach from Cameroon to the mountains surrounding Lake Kivu. Despite the fact that most of the languages spoken in Central Africa derive from the Bantu group within the Niger-Congo language family, a wide variety of languages emerged in the region. Central Africa is plagued by bouts of scarcity that severely hinder forward economic and social growth. The entire region is faced with insufficient funds and resources, and while the shortages are felt throughout the region, in the area of planning organizations it is most acute. These planning organizations, which would otherwise be responsible for creating public policy and developing a coherent social policy are left without the necessary funds for development. Without funds to development and monitor research, Central Africa is unable to articulate a coherent social policy to eradicate the poverty endemic to the region. Central Africa was opened to relations beyond its borders in the fifteenth century, when interaction began with the Mediterranean world of Islam, which remained limited until the nineteenth century. Also in the fifteenth century, the region began relations with the Atlantic world of Christianity. In the early sizteenth century, Leo Africanus visited the northern states of Central Africa and described them in Latin for the benefit of the Vatican, where he worked for a time. During the period of the colonial era, the church played a critical role. So few services were provided to the people by the governments that the Christian missions stepped in to fill the gap. Albert Schweitzer set up a hospital in the heart of French Equatorial Africa. British missionaries took on the task of providing basic education and minimal welfare services. A Catholic university was established by the Belgian Catholics, which was open to both colonial whites as well as black Africans. Churches took on greater formal and informal responsibilities for health and education and for communications and financial services in remote areas when the state was unable to provide. Winters, Clyde. Ancient Writing in Central Africa. Yahoo! Retrieved July 25, 2007. Austen, Ralph A. Mapping Africa. Fathom Archive. Retrieved July 25, 2007. Encyclopedia Britannica. Central Africa Growth of trade. Retrieved July 25, 2007. Governments on the WWW. 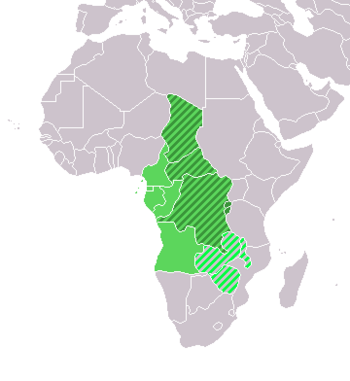 Central Africa. World History Archives. The history of Central Africa. This page was last modified on 23 January 2017, at 20:16.